Jake Turner (Marchini) is in Colombia Punchfighting for money and generally looking for a new assignment. His old buddy Bill Digger (Estevez) contacts him about a missing government agent, Jennifer Boyden (Gaunt). It affects both of them personally because she’s the daughter of their old Marine Sergeant. Digger has already sent another soldier to try and find her, a man named Edwards (Rogers). But Edwards was captured by the evil super-criminal Pike (Meyer). When even Digger falls into the hands of Pike, Jake Turner now has to save him, Edwards, and Jennifer. He certainly has his work cut out for him. Can Jake save the hostages and finally defeat Pike? Find out today! 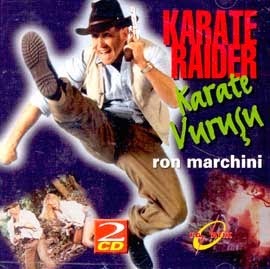 Sadly, Karate Raider was Ron Marchini’s last film role. But it’s the first credit ever for Joe Carnahan, who wrote the movie with Marchini. Carnahan went on to direct Narc (2002) and become a big name in Hollywood. So, circle of life. It’s also the only role for one Shelly Gaunt, who played Jennifer. But it’s probably just as well. It’s pretty surprising, given Marchini’s off-screen status as a Martial Artist, and the penchant for Punchfighting movies at the time, that he never made an out-and-out movie about Punchfighting. Karate Raider is as close as we’ll get, with one scene. Then his film career ended, in our opinion, prematurely. But judging from Marchini’s vest and fedora, as well as the musical score, and the title of the movie, it seems this was his answer to Raiders of the Lost Ark (1981). While no one is going to mistake Marchini for Harrison Ford, there are still moments to be savored here. Also in the “Huh?” department is a brief sit-down role from Burt Ward. His front-and-center placement on some box art doesn’t exactly match his screen time. But I can see why the distributors did that. We can’t count the times We've been in a video store, just browsing, and we picked up a video that we've never heard of before and yelled “BURT WARD’s in this? Sold!” Or maybe we were just confusing him with Burt Young. Nevertheless, the presence of Ward is really, in actuality, just a testament to how much Marchini must have loved the old Batman TV show - let’s not forget Adam West is in Omega Cop (1990). Karate Raider remains one of the rarest Marchini’s - to date it has only been released on VHS in the Netherlands, just like Jungle Wolf (1986). He must have an amazing fanbase in that part of the world. Regardless, it makes a decent enough capper to his screen career, but we have to say, we were left wanting more. Mr. Marchini, it’s never too late to come back. This film also goes under the title Karate Commando: Jungle Wolf 3. This was also released in Greece on Spentzos Film Home Video. How did you get your hands on it? We saw at a friends house on his computer. He downloaded it. Ah OK, what site did he download it from? If you could ask him what site it was, that'd be great. He told me it was invite-only movie torrent site. Ah, i'm guessing it must be Cinemageddon then, I heard of that site through the creator of Critical Condition online. According to imdb, this is a different film than Karate Commando: Jungle Wolf 3. Have you seen that one? Haven't seen that one. Very hard to find.